"Michael, since I am also boycotting Diageo, what other distillery's single malt should I try since I no longer purchase bottles of Talisker?" Good question, No one ever. There are many non-Islay moderately peated high quality single malts on the market. Highland Park, Ardmore, and Longrow are the first brands/distilleries that to come to mind. They each peat their whisky differently, but most of the time their malts' peating expresses itself at medium levels. Last May, one of my readers, Mantisking, recommended Kilkerran as a good alternative to Talisker. Brilliant idea. 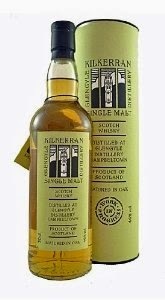 I am a BIG fan of Kilkerran's single malts (here's my rave review about WIP #2). They come from the Glengyle distillery in Campeltown and are owned by the same company that runs Springbank. (I recommend Chemistry of the Cocktail's envy-inducing distillery writeup for more information.) They reopened and started distilling again in 2004. Each year's release is still being called "Work in Progress" as Kilkerran progresses towards a 12 year old single malt in 2016. Work in Progress #1 was a five year-old bottled in 2009, Work in Progress #2 was 6 years old in 2010, etc. Like Kilchoman, these young malts from a small distillery are very impressive, easily kicking the teeth out of their older competitors when it comes to quality. So, since I just bombarded you with a bunch of Talisker reviews. How about a few Kilkerrans? Maturation: ex-bourbon American Oak barrels, possibly some ex-sherry casks? The color is light amber......good start. The nose is piney and minty, with new sneakers and baseball card 9-pocket plastic pages. Then peat moss, dirt, and unripened stone fruit. Barley, actual barley. A whiff of sugary candy, very subtle vanilla, denim, and moldy books. The palate starts with dense toffee and butterscotch with some lemon zest around the edges. Some pleasantly sharp spirit, with a little bit of smoke and menthol. Then in the middle, it's as if one just dropped one's Werther's Original into the dirt but picked it up and ate it anyway. With time, maybe there's hint of an old moldy sherry cask? A burst of orange and lime skins in the finish. Then brown sugar, menthol, a smoky toffee, and a caramel-covered prune. I actually got so involved with this one that I was too far down the glass when it came time to add water. I'm infatuated with the nose. The other parts are good too, but the nose was undecorated dirty malt. Love it. WIP2 was a little more gritty (in a good way) as there was less oak influence. But the oak isn't aggressive here (maybe due to refill casks?) as it plays well with the other elements. That hint of sherry is entertaining, sort of a slight seasoning. The peat also remains in the background rather than the foreground, peeking out when the time is right. So, like the second WIP, Work in Progress #3 is for someone who likes some barley and earth and zip in his whisky. It is still youthful, but the spirit is so good that it's a pleasure when it sings out. I would happily choose this 7yo over almost every OB 12yo out there. So I can't imagine what this single malt is going to be like on its twelfth birthday. I agree with you about this one. It's definitely young, but the careful distillation and maturation have kept that from impinging on the other good qualities of the spirit. I'm hoping the earthiness carries through in future, because it would be a great signature flavor profile for the distillery to set it apart from Springbank. There's also a bunch of this left in Oregon if anyone wants it, but the price is a little unreasonable. I'm hoping they'll put it on closeout soon so I can pick up a bottle. I like the earthiness A LOT. It would be great to see it stick around and not get covered over with oak. They have their own website now, completely separate from Springbank's. It'll be interesting to see if they'll try to market it or just go the low-budget approach as with the rest of their brands. Is it WIP3 on the OR shelves? Because I've never actually seen a bottle in the wild, instead only on UK retailer sites. Yup. It's definitely the light green canister. They actually hiked the price last year, which is a laugh. I don't mean to hurt anyone's feelings but I got my WIP 3 from Party Source (before they stopped shipping) during their crazy Campbeltown sale of Summer 2012. How much did I pay? All of...wait for it, wait for it...$37. Was I smart enough to get more than one? Alas, no. @MAO, you hurt my feelings at least three times in that comment. @Jordan, I think you might have mentioned they hiked it to $80 last year, which is a weird price point to choose. Whenever they do put it on closeout, it's party time. MAO, I snagged some other sweet deals from that TPS sale, so I can't really complain. I love to complain, so I'll complain for two.